My son is a video games enthusiast. He is very focused and persistent in mastering whatever game he is playing. It’s a very serious business to him. On one occasion he told me that he was going back to basics in order to further develop his skills. He is very focused when he is playing but when he got to a certain point he realized he had to go back to basics. 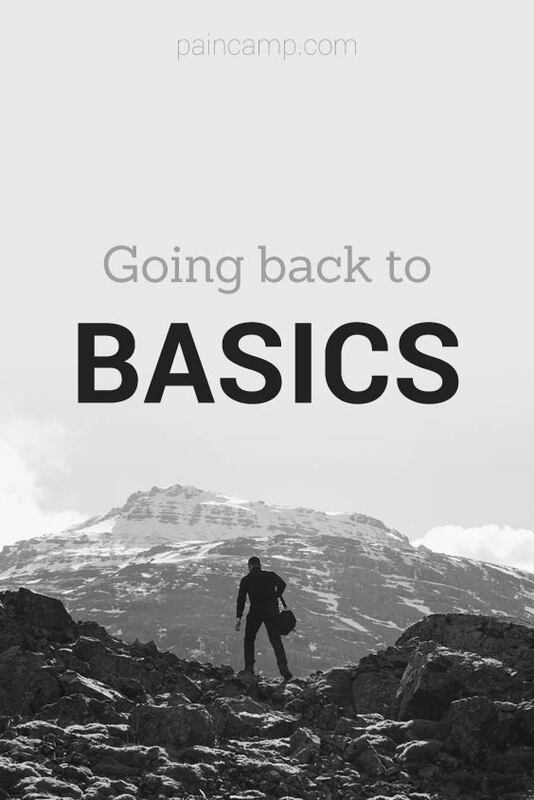 In my tai chi practice we always go back to the basics no matter how advanced we feel we should be. My teacher is not slow to criticize when she sees a student get too arrogant. Accepting our limitations and weaknesses can make us so much stronger. Tai chi is a soft martial art. To be successful you must give up on the idea of overpowering your opponent. The better you wish to be the more you must give up on striving to be better. In Tai chi, strength has it’s foundation in softness. This is the softness of the universe flowing in and all around us. We acquire a flexibility through practice against the hardness of the physical world and it’s challenges. We accept that by softening our resistance to the moment we become more relaxed and focused. So as chronic pain sufferers what are our basics? And how can we become more relaxed and focused. The problem is chronic. We are prone to flare ups when our pain seems so much worse and unmanageable and then we hopefully gain respite or remission. It can be a hell of a shock when you have been going through a period of remission and then suddenly you are thrust back into severe pain again. With that pain comes the “brain fog”, the irritability, depression, downward spiral of inactivity and so on. I find with my chronic pain I go through the same cycle again and again. Just when I’ve gone through a really good period with manageable pain levels, the bottom falls out of my world and I’m thrust back into the thick of the fight again. This can be terribly disheartening. It is not simply the challenge of managing this part of the pain cycle again. It is much more than that. The real crunch is accepting that this is where you have landed again. That this time, again, you are back at the bottom of the mountain having climbed it so many times before. It takes tremendous mental and spiritual fortitude to get yourself moving again. I try to focus on what I can do but this is never easy. It is the terrible weight of the task that makes the decision to continue yet again so difficult. Sometimes the usual mantras of “this too will pass” or “ this is just a flare-up” or “ this is just stage x of the process” just seem too false or lightweight to deal with the difficulty of the moment. I have to admit to myself that there is no easy answer, no perfect plan or path. I suffer and I continue. Sometimes I recover more quickly. Sometimes I am lucky with the hospital interventions. Sometimes I am not. The only thing that I am sure of is that it is possible to continue. Everyday we fight the good fight to be as normal as possible. However, it could be that there is a certain “giving up the fight” when you’ve had to restart again and again. I don’t mean giving up on keeping going. I mean giving up on that idea we have of how life should be. We say things to ourselves quietly like: it shouldn’t be this hard, or why me, again? If you can “give up the fight” I believe that it could be possible to find that place deep inside that accepts that whatever happens is ok. The ancient Taoist sages said that even if a mountain should collapse in front of you there is no need to fear the future and to accept the present no matter how bad it appears right now. It takes practice and it hurts to “give up”. So if nothing else can be gained from these crises, perhaps we can practice giving in, accepting how things are right now and not giving up. Let those be our basics. Niall Finn worked for sixteen years as a nurse manager and counselor in the mental health services in Ireland. During this time he trained as a Psychotherapist. He has chronic pain due to a rare condition called hydromyelia and has used his experience to write in a helpful and empathic way about how to live with chronic pain. [su_note note_color=”#d0e3cf” text_color=”#000000″ radius=”0″] Check out Niall’s book, Staying Sane with Chronic Pain. The focus of the book is how to find a way of coming to terms with pain and live with it in such a way that your mental health and your peace of mind is of primary importance. good article.im reading the book at the moment its very good for me .im really struggling with the whole thing pain surrenderthing . I think the first step is all about surrendering. Once I surrender, I can rest and regroup. It is a great book indeed! We’re lucky to have Niall writing for us! 🙂 Stay tuned for more great articles from him!